Old Burdick’s is a local restaurant franchise with locations around the Kalamazoo area. I’m kind of surprised I haven’t reviewed them before, they’re kind of a mainstay in the area, since they have a full menu of lunch and dinner entrees as well as a full bar. Anyway, I’ve had the Triple Threat, one of their latest burgers, recommended to me multiple times, and since a friend from out of town was visiting, I decided to splurge and check it out. The Triple Threat, in all its posed glory. The Triple Threat consists of a half-pound burger patty, a bratwurst patty, and a wheel of fried Provolone cheese, topped with lettuce, tomatoes, and onions. As a fan of larger, more ambitious fare, it looked to be right up my alley: not quite Man vs. Food scale, but with a classiness and a vision I enjoy. And enjoy it I did!! The burger was served medium well, and the Provolone added a crispiness and a flavor I enjoyed. The bratwurst was a clever, tasty addition, and the onions, lettuce and tomato were all prepared with some dressing, to add a bit of twist. It was an enjoyable, hearty burger, perfect for someone with an adventurous palette. My only complaints with the burger itself were that the flavor were at times too complicated (with the special lettuce and tomato, it tasted like more than three threats), and that the sandwich was just so darn big. It was kind of difficult to fit in my mouth, and you need to have an appetite if you want to finish it. My other problem was the cost. At $13.99, it’s too pricey for most people to try on a whim, delicious though it is. I’ve since been informed that Wednesdays and Sundays are half-off for students, so I’d recommend those who can to take advantage of that. 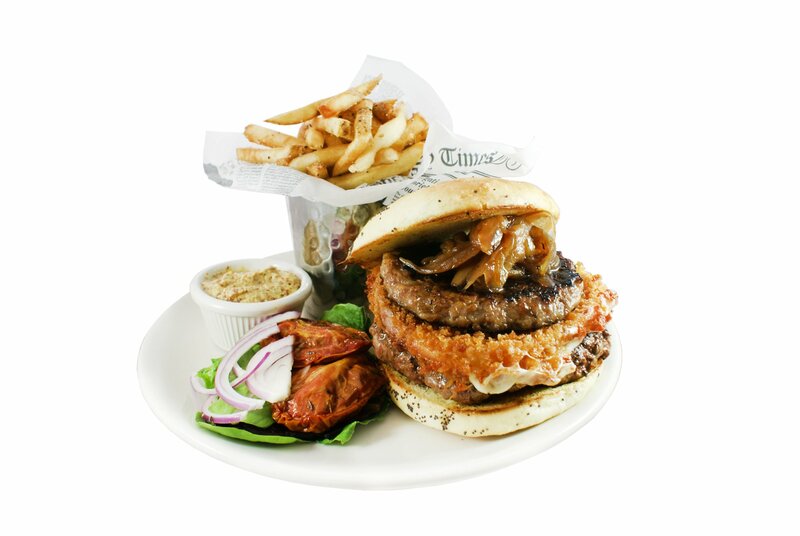 Still, if you’re interested in a challenge and don’t mind spending a little bit, the Triple Threat Burger is a good bet. I was one of those that recommended this for review. I ate a Triple Threat once and started it afraid, it then lulled me into a false sense of security before ending with regret. Perhaps a little more than I could handle, but a sandwich I enjoyed. Hi Joe, my name is Sarah Lee and I’m the marketing manager for Greenleaf Hospitality Group where Old Burdick’s is part of that group. Thank you for sharing your review on one of our popular menu items at Old Burdick’s and glad you enjoyed your meal. If you haven’t seen or heard, we have other sandwiches and burgers that are smaller in size and friendlier to those who are watching their calories. Check it out when you get a chance especially on Wednesday/Sunday when food is half off for college students.